Julia Louis-Dreyfus accepts the award for outstanding lead actress in a comedy series for “Veep” at the 68th Primetime Emmy Awards on Sunday, Sept. 18, 2016, at the Microsoft Theater in Los Angeles. The show will end following the 2018 season. HBO says its much-honored political satire "Veep" is coming to an end. The cable channel said Wednesday that "Veep" will air its seventh and final season in 2018. Series star Julia Louis-Dreyfus won five consecutive Emmy Awards for her portrayal of Selina Meyer, a self-absorbed politician and failed president. The actress is up for a sixth trophy at the Sept. 17 Emmy ceremony. 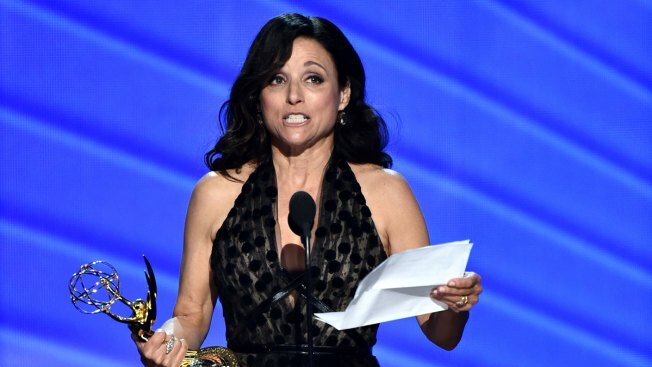 Louis-Dreyfus tried to comfort "Veep" fans over their pending loss. "It's true BUT don't despair cuz we still have a whole season 7 to write and film," she posted on her Twitter account. "Veep," has also won two consecutive best comedy Emmys, and is in the running to repeat. Tony Hale, who plays Meyer's overly devoted personal aide, Gary, could pick up his third best supporting actor Emmy. HBO programming chief Casey Bloys wrote in a statement that HBO respected the producers' decision to bring the show to a close, calling it "bittersweet."